DW was adept at commercially positioning his business, at finding interesting material to sell, and at marketing that material in innovative ways - but the core of any retail business is inter-personal relationships, and DW assiduously cultivated his customers. 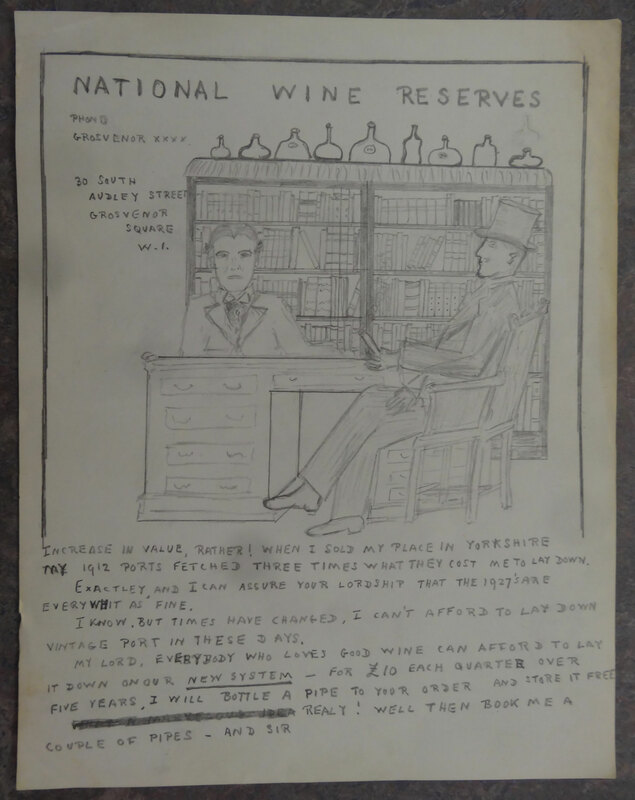 This charming sketch, drawn by DW himself and aimed at advertising his business in Port, was discovered in Leeds University’s Special Collections in early 2017, and it gives the most reliable impression we have of what the interior of DW’s wine shop looked like - as well as a rather charming self portrait of the author as a young man. My thanks to Darren Nugent for pointing out to me that 'a Pipe' is sixty dozen, or seven hundred and twenty bottles - so 'Two Pipes' would have been one thousand, four hundred and forty bottles - by modern standards a very substantial quantity ! Provenance: Reproduced with the permission of Special Collections, Leeds University Library (MS1942), and with thanks to the Wheatley family.